When Natalie Royer joined the College of Veterinary Medicine in 1983, she was one of only three veterinary technicians in the Veterinary Teaching Hospital. When she retires at the end of the month, she will have been one of nearly 40. 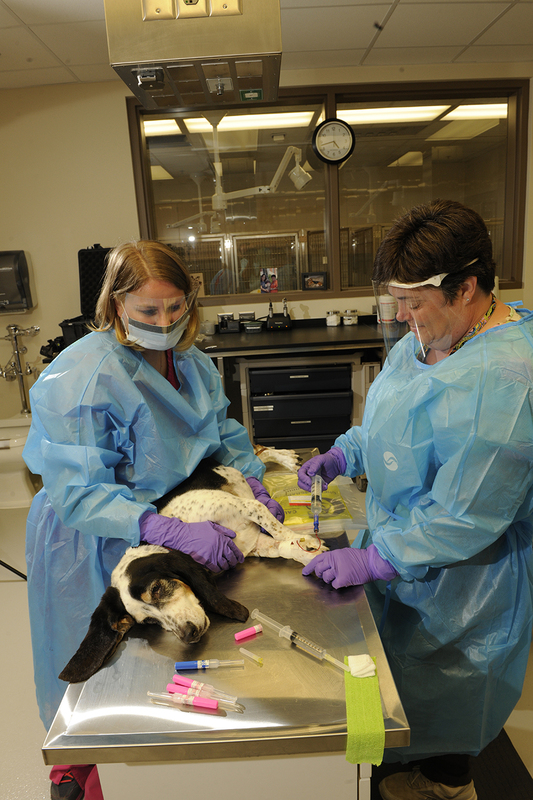 Natalie Royer, at right, starting an IV oncology treatment on a pet. 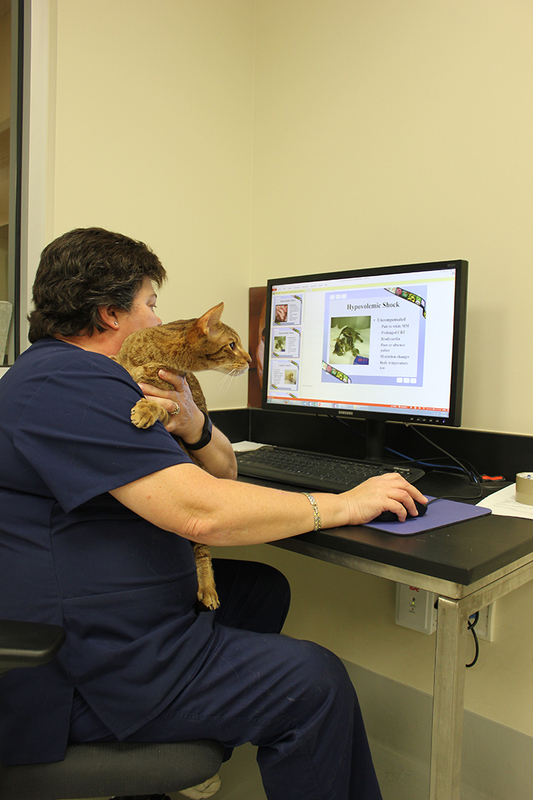 It is difficult – if not impossible – to calculate the number of hours Royer has spent instructing veterinary students, comforting pet parents and administering health care to animals. One thing is for sure; it has been Royer’s life calling and she’s enjoyed every minute of it. After more than 33 years at the College of Veterinary Medicine, Royer says it is time for a new adventure, and while not wearing her scrub uniform won’t bother her, it will be much more difficult to not see the patients, clients, students, and colleagues every day. As a veterinary technician, Royer, and those in the professional field, are nurses in veterinary medicine. They play an important role in the health care of animals, involved in everything from assisting the veterinarian in surgery, wound care, checking vital signs, performing routine tasks and speaking with clients. At the College of Veterinary Medicine, technicians have the added responsibility of teaching students how a specialty service operates, and giving them day-by-day instructions in the specialty. When Royer arrived at the college, she served as a technician in the Ophthalmology Service, and later moved to Soft Tissue Surgery where she worked in the ward as well as in surgery. Royer working in the teaching hospital with a client’s pet. “I became quite good at disconnecting O2 hoses to see if students were paying attention, so much so that Dr. (Ralph) Henderson added a question about it on one of his tests,” she remembers. In 1991, Royer began working in what was later to become the Oncology Service, one of the most demanding and active services in the teaching hospital. For 26 years, she has cared for the ‘sickest of the sick’, working to extend the life of her patients and bring their owners joy, even if only for a short amount of time. “Many of our patients don’t survive, but many have a good quality of life for as long as they can, and I take comfort in knowing that we helped them do that,” Royer says. 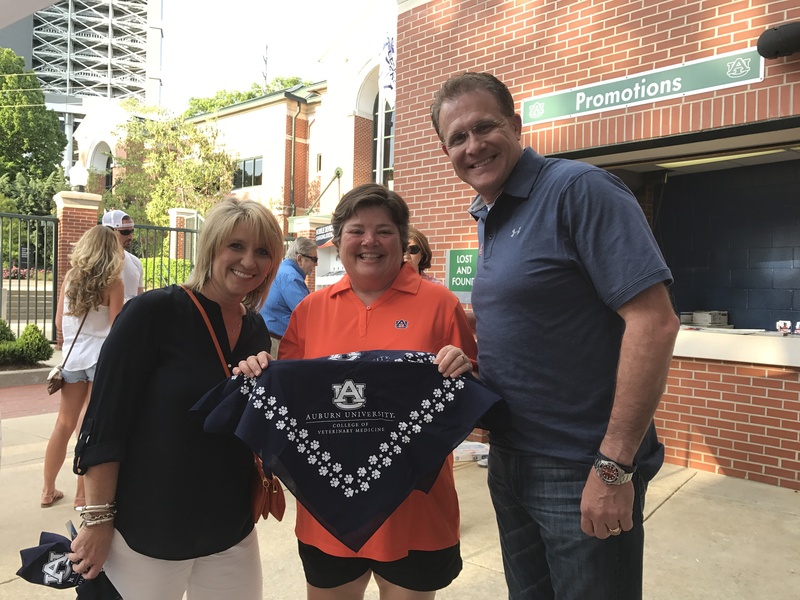 Natalie Royer talks shows off the Veterinary Teaching Hospital and the College to Gus and Kristi Malzahn. Royer’s impact on the Oncology Service is something that all who come through it have felt. She has been the comforting hand to those making life decisions about a pet’s health, the ‘pop quiz’ expert with students before big exams, the kind but firm colleague wanting to make sure a patient is taken care of, and the voice of reason to residents, interns, and faculty during trying times. “Natalie IS the Auburn College of Veterinary Medicine’s Oncology Service,” says Dr. Annette Smith, the Robert & Charlotte Lowder Distinguished Professor of Oncology and coordinator of the service. “She helped train me from a baby resident,” Dr. Smith said. “She was part of the team that started the Oncology Service back in 1998 when it was one medical oncologist (Dr. Bill Brewer), one surgical oncologist (Dr. Ralph Henderson), one radiation oncologist (Dr. Bill Brawner), one technician (Natalie) and one oncology resident (me). “Since then she has helped to train and mentor multiple technicians, interns on the service, and oncology residents,” Dr. Smith said. “She consistently receives the highest praise from clients due to her dedication to her patients.